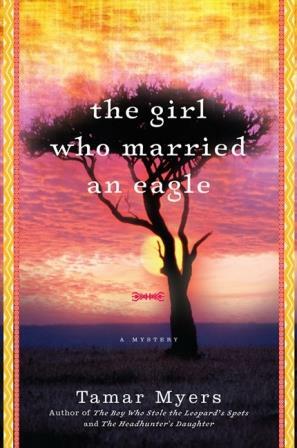 Based on actual events in Tamar Myers’s life, The Girl Who Married an Eagle is a beautiful addition to her Belgian Congo mystery series. When Julia Elaine Newton, a young, pretty Ohio girl, volunteered to go on a mission to the Belgian Congo, she knew it was going to be a huge change. But she never expected to wind up teaching at an all-girls boarding school that consisted mostly of runaway child brides! Much to her chagrin, Buakane was born beautiful. If only she’d been ugly, Chief Eagle would not have noticed her. Escaping from an arranged marriage, the scrappy young girl finds her way to Julia Newton and the school. But this time her jilted husband will not be denied. Now it’s up to Julia and Buakane to try to save the school as Congolese independence looms and Chief Eagle is set on revenge. With the help of Cripple, Cripple’s husband, and even Amanda Brown, these plucky women must learn to save themselves. First things first, and anyone who has read this book can call me crazy, but The Girl Who Married an Eagle never read like a mystery for me, as it is said to be in the title. (I'm sure I may missed something along the way, but I don't think so.) Additionally, I think the synopsis is pretty misleading, though not entirely untrue. After reading the book and looking at it again, I must admit that I scratched my head. That being said and out of the way, it was a nice work of historical fiction that I enjoyed reading. There was a lot of Christianity involved in the novel, too, but I don't think this qualifies as Christian fiction. It was a part of the story, but I don't think the religion was the main focus of the book. The Girl Who Married an Eagle is all about the characters and the way they interacted with each other. My favorite character in The Girl Who Married an Eagle was not Julia, the naive missionary, or the Bashilele girl, Buakane, but the motherless Clementine Hayes. She is a nine year old prodigy who has mastered life in the African wilderness better than the adult missionaries. She speaks the local languages flawlessly, and even Nurse Verna Doyer, who calls her the Great Distraction, needs her for translation purposes from time to time. She saucy, witty, and damn near sacrilegious, being quick to tell anyone that she's not worried about her behavior because she can't be baptized until twelve. Julia was constantly wanting to gather Clementine up into a hug, and I felt the same way. Cripple, who is just as her name states, is a close second with her sharp tongue and straightforwardness. Her interactions with Julia always made me grin. As for Julia, she felt the call of God in Ohio and followed it all the way to the Belgian Congo. Though she learned the language, she did not learn or take in much of the customs, and found herself getting in... situations. Buakane is not the runaway child bride that is implied in the misleading synopsis. She is a dutiful daughter, though headstrong and questioning, but more wandered into the missionary school than escaped. However, she had spark, and I ended up connecting with her by the end of the novel. The Girl Who Married an Eagle was not at all what I had expected, but it sucked me in, and I breezed through it. If you're looking for a book about missionaries and the natives they're out to save or a book with strong, stubborn heroines, The Girl Who Married an Eagle is well worth your time. Tamar Myers was born and raised in the Belgian Congo (now just the Congo). Her parents were missionaries to a tribe which, at that time, were known as headhunters and used human skulls for drinking cups. Hers was the first white family ever to peacefully coexist with the tribe. Today Tamar lives in the Carolinas with her American-born husband. She is the author of 36 novels (most of which are mysteries), a number of published short stories, and hundreds of articles on gardening. 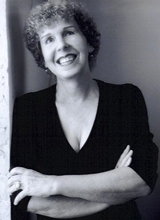 Find out more about Tamar and her books at her website. The Great Distraction is the PERFECT nickname for a kid - I love it!